Pursue your interest in marine animals and share your knowledge and enthusiasm with others by becoming a member of the volunteer staff at The Maritime Aquarium at Norwalk. Interviews for potential volunteers – with details provided about a training course in March – will be held on Wed., Feb. 13 and Thurs., Feb. 21, on both days at 5 p.m. You need attend only one. Prior knowledge about marine animals isn't necessary to be a Maritime Aquarium volunteer. That's what will be taught in a four-week training course, which will meet at 7 p.m. on Tuesdays and Thursdays from March 5 to March 28. You must be at least 15 years old to sign up. 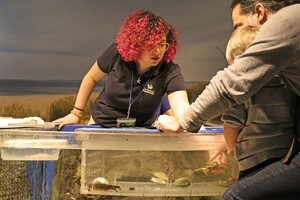 After completing the course, volunteers serve as gallery ambassadors, helping Aquarium guests to learn more about the represented animals of Long Island Sound, from crabs and jellies to seals and sharks. Adults are especially needed for weekday time slots. The minimum time commitment required from volunteers is 100 hours, at four hours per week for weekday volunteers and four hours per month for weekend staff. Letters of recommendation and other service-award forms will be signed by Aquarium staff at the completion of 100 hours of service. A $40 fee helps to defray the costs of training materials and uniforms. Volunteers receive discounts in the Gift Shop, Cascade Café and on many programs. Advance registration is required for the interview sessions and volunteer training course. To get more details and learn how to sign up, go to www.maritimeaquarium.org/volunteer or call (203) 852-0700, ext. 2225.